Artist, painter and writer James Edward Leonard Eldridge, 88, also known as Æthelred Eldridge, passed away this week. Eldridge was an associate professor of painting at Ohio from 1957 to 2014. Eldridge was an acclaimed avant garde painter perhaps known best for his black and white works made up of stylized, blocky shapes accompanied by esoteric phrases in the style of 18th Century English poet William Blake. His most recognizable work in Athens might be the Siegfred Arch that is a part of Siegfred Hall on Ohio University’s Athens campus, which serves as the principal home of the Ohio University School of Art + Design. 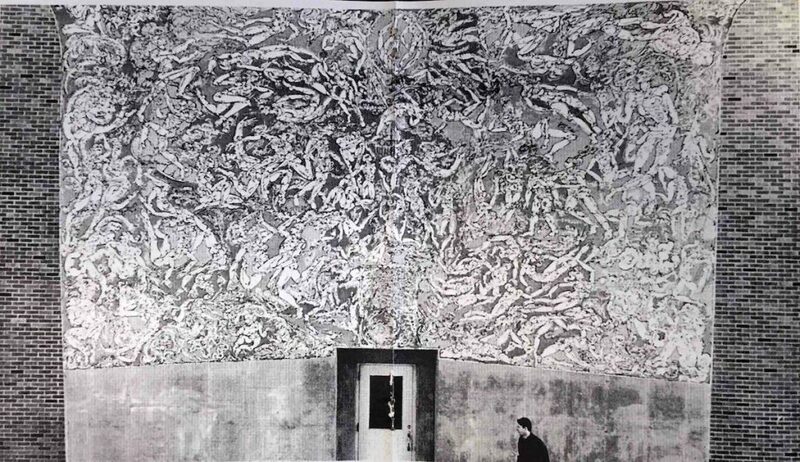 The mural was initially commissioned in 1965 by then University President Vernon Alden, and completed, all figures and no text, and possibly in color, by Eldridge in 1966. A second iteration of the mural was crafted some years later by the artist, made up entirely of six columns of text. The mural was brought to it’s most recognizable form during a redesign by Eldridge in 1987, and most recently restored in 2015 by graduate students Berry O’Keefe and Amanda Morris. He is listed in the Dictionary of the Avant Gardes by American art critic and avant-garde art expert Richard Kostelantz.